Free Wi-Fi free breakfast and plush beds are all part of the deal at the non-smoking Microtel Inn and Suites Hazelton off of I-68. The 59-room three-story Microtel Inn which was updated in 2011 features sinfully soft comforters crisp linens with high thread counts and extra pillows; this non-smoking hotel piles on other perks as well such as free long distance phone calls (within the continental U.S.) free Wi-Fi cable TV with a free movie channel microwaves and mini-fridges. The complimentary continental breakfast includes muffins bagels toast hot and cold cereals coffee tea and juice. 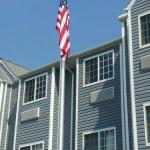 Laundry facilities and barbeque grills are available. Pets are welcome for a fee. The Microtel Inn is off I-68 in Bruceton Mills near the borders of both Maryland and Pennsylvania. It is five miles from Big Bear Lake which offers excellent hiking trails and boating opportunities. Coopers Rock State Forest which is 25 minutes away also offers hiking and biking trails. History buffs can head 30 minutes to Wharton PA to visit the historic Fort Necessity Battlefield which figured in the French and Indian war. Morgantown Municipal Airport is 25 miles away.